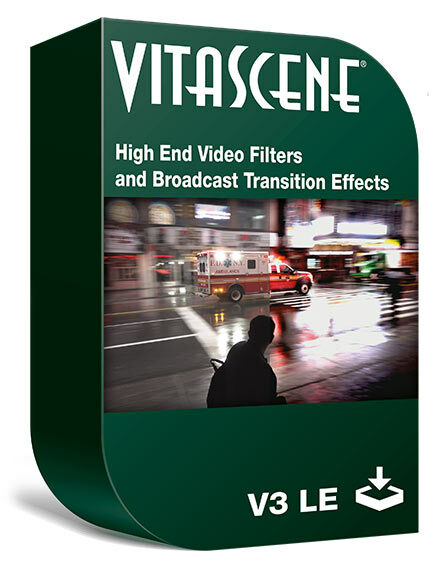 For a limited period you can buy Vitascene 3LE at a reduced price if you have already bought EDIUS 9. There is a special offer running from 14/9/18 to 31st March 2019 where you will get Vitascene 3LE free with a new purchase of EDIUS 9. If you bought EDIUS 9 before the offer started you can get Vitascene 3 LE at a reduced cost of £39+VAT, £42 inc.
Vitascene LE is a collection of 100 filters which add different looks to your image and a range of fancy transitions. There are glow and sparkle effects, grading and film looks, and a range of filters that add dust dirt and other effects to the image. Vitascene works as a plug into EDIUS so you just drop it on the clip, just like any other effect, open the interface and tweak the parameters and save back to EDIUS. Effects are keyframable and you have a range of controls over them. Vitascene 1 used to ship with EDIUS 6 so you may already be familiar with the kind of things it can do. There is also a full version available with a lot more filters and effects. If you order from the button below you will be ordering from the European distributors of EDIUS, with support from DVC training in the UK. This will also give you a proper VAT invoice. What is the difference between Vitascene 3 full and LE? 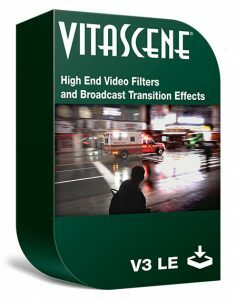 What can Vitascene 3 do? The following video was made by ProDad, the company who make Vitascene. It is for the full version of Vitascene so some of these features may not be available in the LE version.